Reggie Dokes has been considered by some of his fans as one of detroit’s most underrated and overlooked producers/ Djs in electronic music (house / techno). However ,this hat not stopped him from contributing music that is undefinable, ecletic, spiritual and soulful. Reggie has always been about the music, never searching for the spotlight. His contributions to music have been out of love for house and techno, which he was nurtured on since the age of 14 in Detroit. 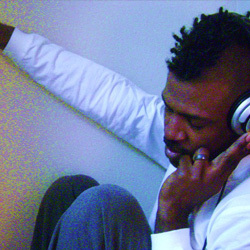 House records coming from Chicago, New York and specially Europe, ultimately influenced him to become a Dj and eventually a producer. Under the mentoring eye of Mr. Derrick May the “Innovator” of Detroit Techno, his friendship with him became the launching ground and inspiration for reggie Dokes’ professional Djing career, exposing him to some of the best dance floors in North America and Europe. In 2001 he decided to start his own label called 2Psychostasia Records” which has released several twelve inch records and three full lenght albums to date. In addition, he has managed to release with other independent labels based on North America: Women On Wax (Dj Minx), Forward Thought (Louis Haiman), Transmat (Derrick May), Sound Signature (Theo Parrish). Also some european based labels :Third Ear Records (UK), Deep Explorer (Spain), Prime Numbers (UK), Rhythmic Deep (UK), Philpot Records (Germany), We Play House (Belgium); Clone Records (Netherlands), Cismo Music (Japan). Lastly, a 12 inch release on Offering Recordings, (Central Republic Africa/ Belgium) featuring a remix by rising star Dj/producer: Culoe De Song, which has created a huge buzz on the dancefloors of South Africa. His new fan base in South Africa, has allowed him to tap one of many: Mandla Mindlo.